The Data Protection Manager installation did not complete successfully. For details, click the Error tab. The SQL Server installation failed. All changes made by the SQL Server installation to the system were rolled back. Manually install SQL Server. 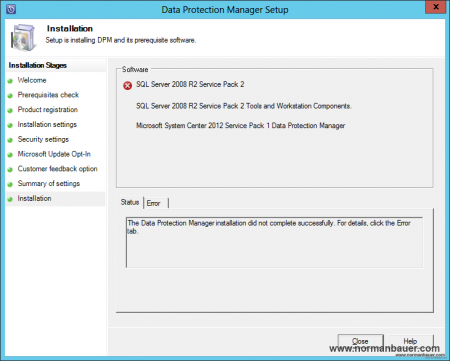 For instructions, see “Manually Installing Prerequisite Software” in the System Center 2012 Service Pack 1 DPM Deployment Guide. 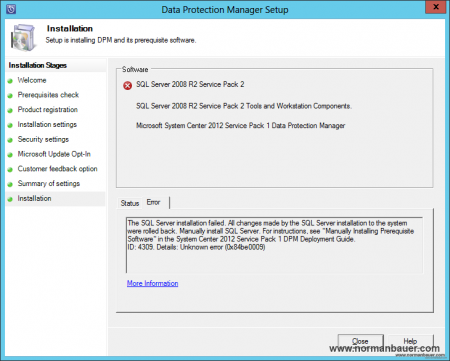 Manually install SQL Server 2008. For instructions, see “Manually Installing Prerequisite Software” in the DPM 2010 Deployment Guide. That was not as helpful as it should have been. 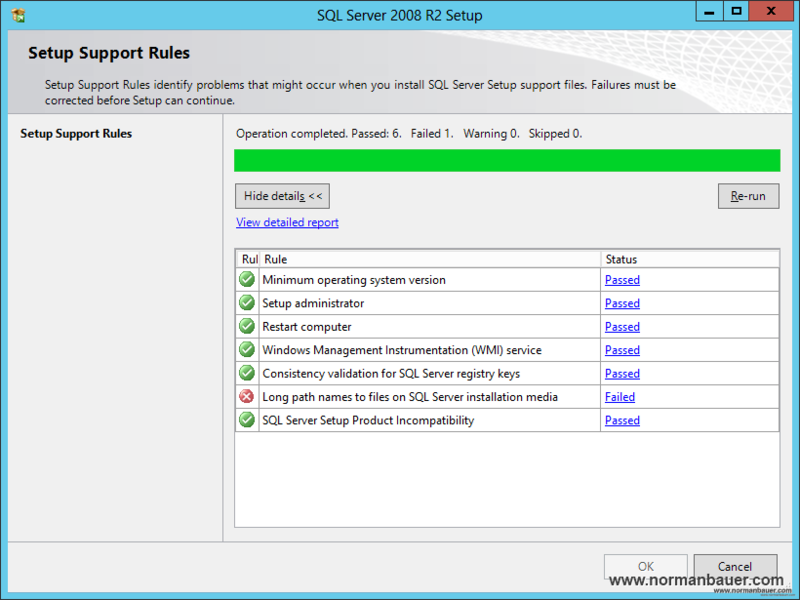 Rule “Long path names to files on SQL Server installation media” failed. 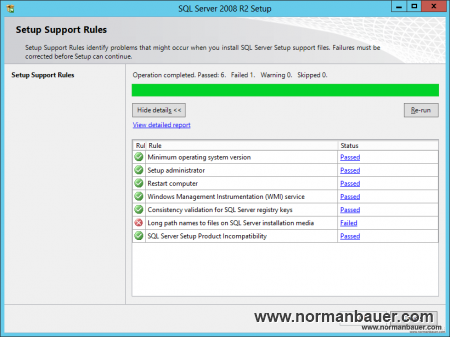 SQL Server installation media on a network share or in a custom folder can cause installation failure if the total length of the path exceeds 260 characters. To correct this issue, utilize Net Use functionality or shorten the path name to the SQL Server setup.exe file. Unbelievable. Truly a buggy installation process. I must have had about 7 goes at installing DPM to get it to work – this was the last issue I ran up against after countless errors around trying to use an existing MSSQL Reporting Server. I gave up and decided to use the built in option and hit this one. It’s ridiculous! I’m trying to user SQL 2012 on the same box as the DPM software and all I keep getting is this lame ‘The required windows components installation failed. (ID: 4023)’ Manually install required components… blah blah blah. 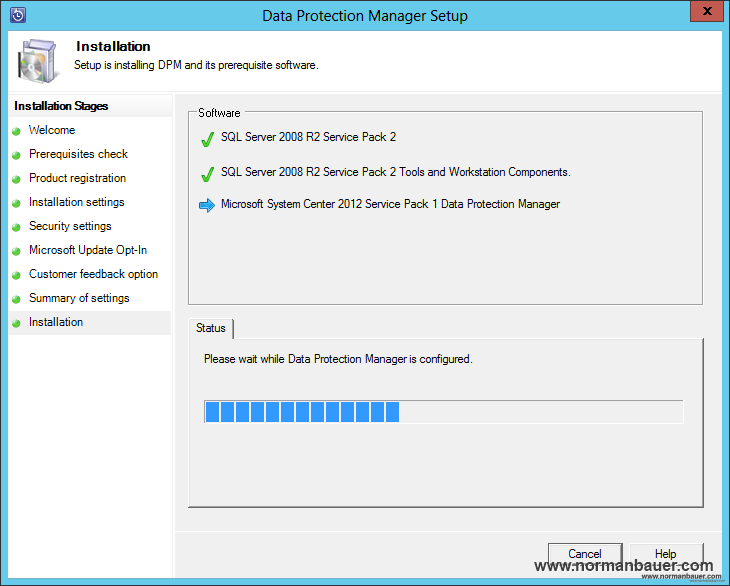 I attempted an in place upgrade of DPM 2012 to DPM 2012 SP1 but it failed. I then uninstalled DPM and SQL and re-ran the install, it failed with an error, (ID: 4309). Then I made sure DPM and SQL was uninstalled. I also deleted any DPM and SQL Folders under the Program Files and Program Files (x86)Folders. I also made sure there were no references to DPM or SQL in the Registry. The Install went through OK. Caution:- Don’t edit the Registry if you don’t know what you are doing.